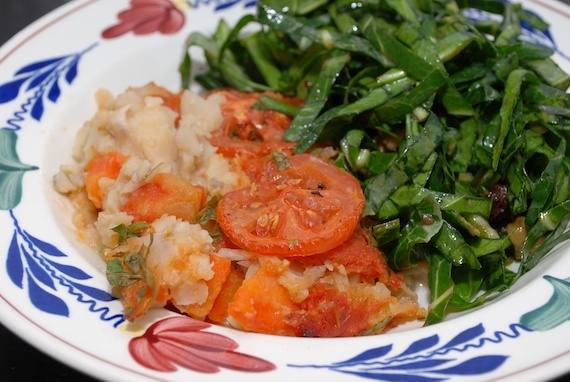 Did you notice the tasty-looking side-dish I paired with the previous post? I first tasted this salad at a cooking demonstration last fall, given by my good friend and talented chef Hilla Abel. I was immediately hooked. So I started making it – a lot – and I haven’t stopped. It has everything you can ask for: it’s a cinch to make, has a little spice, a little sweet, it’s healthy, it’s filling…and it’s DELICIOUS! 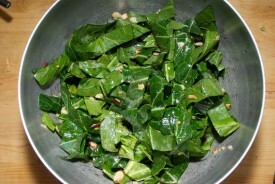 While you can use any hearty green, I’m partial to collards. 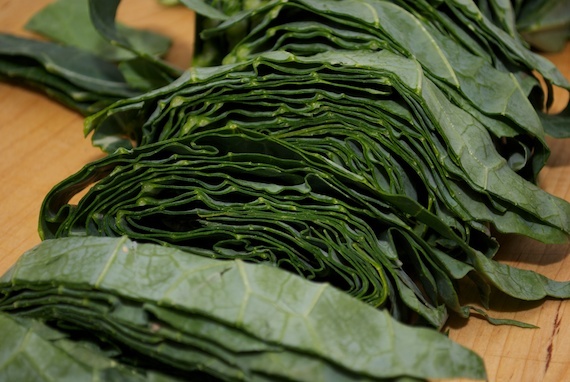 Collard greens are a little over-looked these days, with all the incredible press kale seems to be getting, but I would advise you to try them for this dish. Once the leaves are washed and de-stemmed (see the brilliant “quick and dirty method” Hilla demonstrates here) chiffonade into wide ribbons. Toast a handful of nuts in a dry skillet. I’ve used all different nuts, depending on what I have in the freezer at the time. In an ideal world, I would use sliced almonds or pine nuts, but walnuts or pecans work as well. 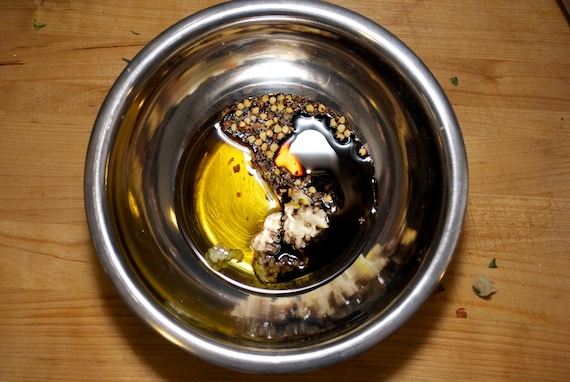 In the mean time, make the dressing by mixing together 1 minced garlic clove, and 2-3 T each of balsamic vinegar, olive oil, and honey. Add a hefty pinch of red pepper flakes (of course you can use less if you’re sensitive to heat). 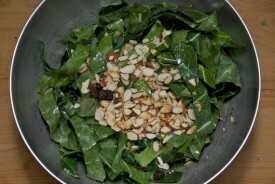 Toss the greens with the dressing and a handful of raisins. When the nuts are fragrant, golden brown and hot, toss into the bowl. I like how the hot nuts wilt the greens. On one hand, it’s best if the salad marinates for a bit before serving, but on the other hand, I like when the greens are a bit tough. Either way, the salad keeps wonderfully, and can be made ahead of time. Thanks Hilla for a great recipe that is now part of my rotation! oooh! Excited to try it!!! @Jeannie – let us know what you think! Thanks! Many thanks for these photos. We make our salad in a similar way but never tried dry skillets. Hi Jennifer! I’ve never made it with Swiss chard, but I assume it will be similar. I wouldn’t keep it marinating that long, though, since it’s a bit less sturdy than the collards. Enjoy and let us know how it turns out! 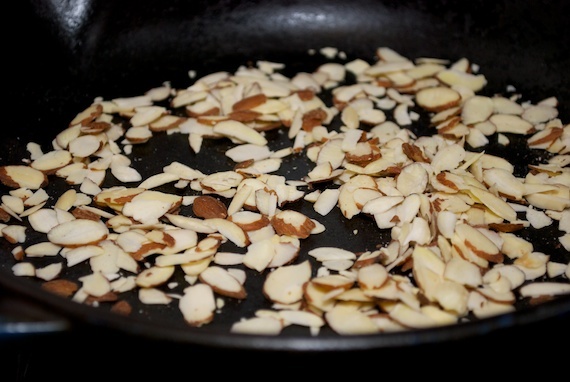 Thanks Alexa-I wilted the greens in the pan after toasting the almonds, just a little bit. Then we ate them right away with the marinade. Yumm. Will do it again with the collards and no cooking. Thanks! !